Musings about things that are usually not as important or complicated as I'm making them. Driving up to campus on Friday I was filled with so much nervous energy. My stomach hurt and I noticed my hands were shaking (kind of like they are right now as I’m writing this). So many wonderful memories flooded my mind and I knew that coming back again would likely make it harder to move on. I thought for a second I should just turn around. I wouldn’t have to be reminded of what I was missing if I never went. But I was also excited! The familiar roads and sights reminded me instantly that I love this place and quickly, as I was greeted by old friends and reunited with my typical Friday afternoon routines, I fell back into a comfortable rhythm. I was home. I felt like I was alive again. I know who I am when I’m at UConn. And so, as I was watching the band rehearse early Saturday morning and remembering all th ose long rehearsals and early mornings, it became apparent that now none of that really mattered. The petty things we thought were so important just simply faded away. All that was left was a warm feeling. If it could speak it would say “this is where I belong”. At UConn, we always say “Students Today. Huskies Forever.” And on top of that, when you’re in the UConn Marching Band, you’re part of a family. These values are becoming more and more meaningful to me each passing day. It’s really quite true! Every year, alumni return for the homecoming game. This year there were nearly 160 alumni band members sharing the field with early 320 students during half time. What a spectacle! And every person was beaming with pride. So you can probably imagine, the passion and excitement about being back was absolutely contagious! Everyone was standing tall representing their affiliations by wearing their memories on their clothing. We collectively relived our college experiences by fondly sharing stories and connecting over our similarities. I was surprised and inspired to meet two alumni brothers of UConn’s chapter of Alpha Phi Omega, a National C0-Educational Service Fraternity, from the 60’s and 70’s who shared with me the lived history of our UConn chapter and explained that “in their day the fraternity and band was life”. I’m glad to see nothing’s changed! 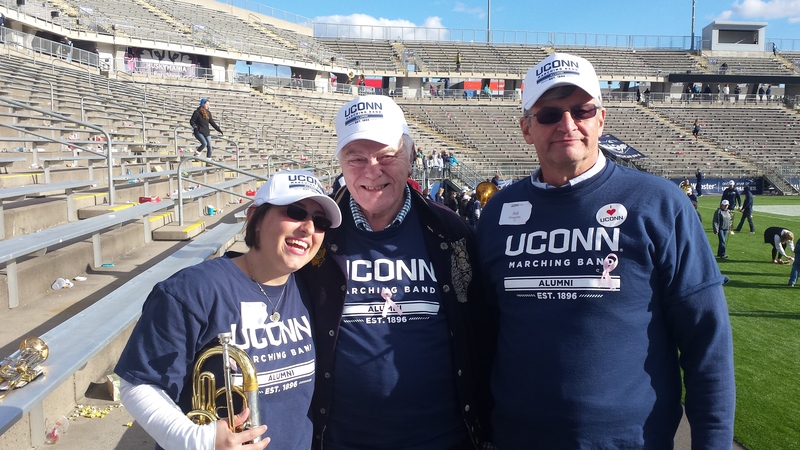 UConn Marching Band alumni and Brothers of Alpha Phi Omega from the decades! It’s really quite stunning though to be connected to all these people. It showed me that I was part of something that’s so much bigger than the four years I attended college. I saw truly how influential these experiences were so many years later. And for those reasons, I made sure to thank each alumni I met for their contribution and commitment to our school. I know now that they really did pave the way for me to have the best experiences I could. For that I am thankful. For a day (and ultimately forever), we were connected and reunited because of our love and pride for our Alma Mater. There’s something about UConn and I can’t precisely put words to it but it’s remarkable. It’s unbelievably special and I’m so lucky! I was blissfully, happy. It was so easy to be comfortable. To be myself. So, this is how I knew I was home: for a whole day, I couldn’t stop smiling. My heart was warmed as I was greeted with hugs and “how are yous” more times than I could count. I was boiling over the top with energy and charisma. I felt like my personality clicked back into place almost like a Lego once it’s re-positioned and re-centered. I could breathe again! Like really breathe! A full deep breath of satisfaction. Confidently and securely I knew who I was in that space and it felt good. These words rings true now even more so than they did the days and weeks immediately after graduation. You know you’re home when you get there and you effortlessly feel comfortable. You can pick up right where you left off and most of your important friendships are salient enough to overcome barriers such as distance, time, or social media. And I am lucky. I’m lucky to be challenged with visiting a place I love so much because I know it’ll be both so wonderful to go back and so difficult to leave. I know that each time I leave and look back I’ll have learned something new about why UConn was so meaningful to me. A good friend said it best. She said, “you can’t miss something if you never leave”. So, in the face o f all my lamenting, a small part of me is appreciative for the opportunity to miss this so much. Because I know I can always go back home. Brown University Urban Education Policy Blog Read my post about ParentCamp USA and parent engagement here! My Cape Town Blog Check out my blog from my semester abroad in Cape Town, South Africa! 3 Things That Changed When I Started Thinking Of Food As Fuel Here’s what changed when I started thinking about food as fuel – on ravishly.com! 5 Communication Strategies That Will Improve Your Relationships Click here to see metacommunication at its finest! Also published on The Good Men Project. Am I A Bad Queer? Am I A Bad Feminist? Sometimes, I feel like I don’t measure up in the feminist or queer communities. Read more on ravishly.com! Asexual Awareness Week: What IS Asexuality Anyway? Click here to read my post on ravishly.com about Asexual Awareness week! Bullet Journaling For Basic People With Lots Of Thoughts Bullet journaling all about what works for you. It shouldn’t feel burdensome. Read what works for me on ravishly.com! Choosing Authenticity: I Own My Story Check out my article on ravishly.com about authenticity – inspired by Love Warrior and Brene Brown! Demisexuality: The Common Sexual Orientation You Might Have But Not Know About Click here to read how I “decode Demi” on ravishly.com & featured on HuffPost Queer Voices! What They Don't Tell You About Your "Roaring Twenties" Click to read one of the best-kept secrets about adulting – featured on ravishly.com! 3 Things I Don’t Want to Hear When I Share About My Chronic Pain (and One Thing I Do) Here are three things I really don’t want to hear when I share about my chronic pain on The Mighty! 4 Reasons I Don’t Want This New Ice Bucket Challenge to Go Viral Read why this particular advocacy effort is really unsettling to me! How I Experience Beach Days as Someone With Chronic Pain Click here to read about my experiences with beach days and chronic pain on The Mighty! RSDSA Spotlight: Dear Body Guest Blog Post for RSDSA. Also featured on The Mighty! The One Statement I Want to Hear From Loved Ones About My Invisible Illness My Story about RSD on The Mighty! When a Group of Teenagers Wrote Poetry About Coping With Chronic Illness Click here to read TALC teens’ poems about coping with chronic illness on The Mighty! You Know You're a 'Hospital Kid' When… Check out my article on The Mighty! about being a ‘Hospital Kid’! Who can relate? 4 Mindful Strategies To Motivate You For Any Run Click here to read about how I infuse my running practice with mindfulness. Running Helps Me Show My Chronic Illness Who’s The Boss Click here to read about how I use running to take control over my chronic illness! BestCarmella on 2017 in Stickers! 2017 in Stickers! |… on My Asexuality Archive!